Counting down, with one minute to go… CAM D is in the lead with four blocks already placed on the top step, Walsh-E has two secured. It’s going to be a close finale! 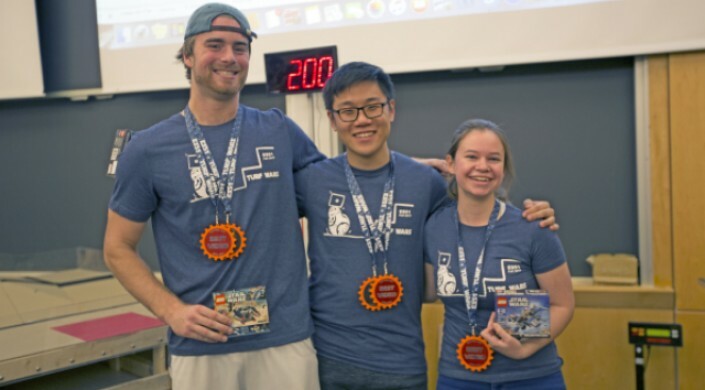 The scene was the Harvard John A. Paulson School of Engineering and Applied Sciences on Dec. 7 as Computer Aided Machine Design (ES 51), a course led by Lecturer Nathan Taylor, hosted its end-of-semester Turf Wars Competition. 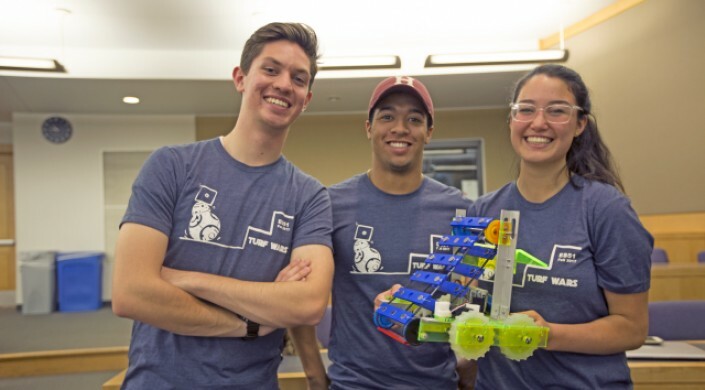 In the culmination of months of machine shop and SolidWorks training, student-developed robots compete in a specially-designed course. 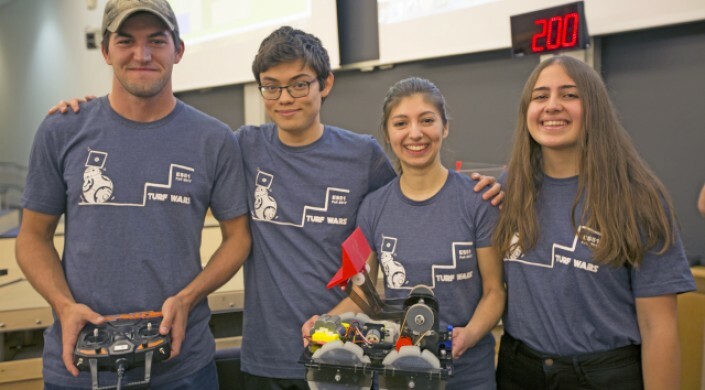 This year’s challenge: design a remote-controlled robot that can drive up ramps and collect and drop off wooden blocks scattered throughout the arena. One student driver controlled the movement of each team’s bot, navigating up and down wooden ramps and placing blocks on tiers of steps. The higher the step, the higher the points. ES 51 students were excited for the competition, but equally pleased to see their designs come to life. “We all put a lot of work into the class, but my favorite part has been designing something from scratch,” said Christian McArthur, S.B. ’20, a mechanical engineering concentrator. “We saw this in our heads and didn't see it in real life until a week ago." The robot designs were each inventive and unique. One team had a simple in-line wheel configuration with a conveyor belt to move their pick-up arm. Another placed front wheels closer together than the back set and designed a geared dump truck-like scoop. 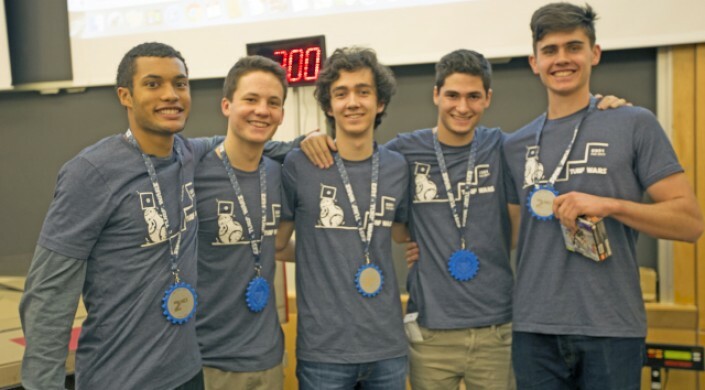 The winning team, after an intense final round, was “CAM D” or Computer Aided Machine Destruction, including Alejandro Gracia-Zhang, S.B. ’20, a mechanical engineering concentrator, Jude Najjar, A.B. ’21, Phoebe Stoye, A.B. ’18, a neurobiology concentrator, and Bobby Collins S.B. ’20, a mechanical engineering concentrator. The keys to their success: a well-tested drive train and an angled arm. “Originally we just had a forward moving scoop, but then realized we wanted it to be able to tilt back and forth. We added a rack and pinion to allow the scoop to tilt downward and better release the blocks,” explained Collins. A high-energy, hands-on introduction to the field, ES 51 is often one of the first engineering courses taken by prospective SEAS concentrators. 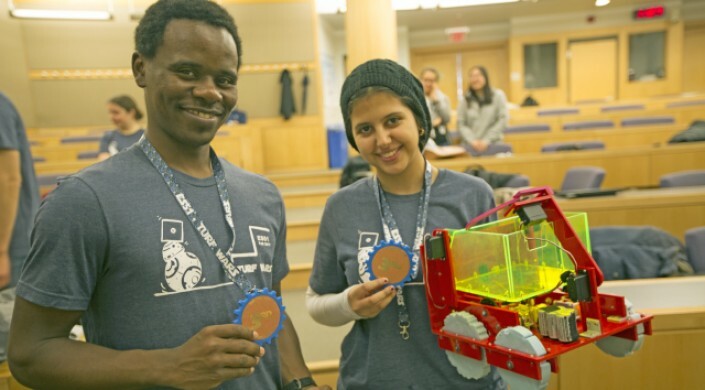 “I am definitely leaning more towards engineering now. It’s the most fun to do projects in teams,” Vatcher added.